The best online flowers in Riga at good prices. Buy flowers and gifts online. ❶ Order the best online flowers in Riga and all over Latvia at the best price. Large choice of bouquets and fast delivery to any address! Order the best online flowers in Riga and all over Latvia at the best price. Large choice of bouquets and fast delivery to any address! To find the best online flowers in Riga it is enough to visit the online shop KROKUS. In our studio you will find flowers and gifts online for any holiday or solemn event. The catalog of goods will offer you fantastic arrangements from professional florists and designers, the service will allow you to make an order in just few clicks, and your own courier service will deliver flowers and gifts online within 2-3 hours directly to the recipient's home. KROKUS can be called one of the most popular online flower shops in Riga and all over Latvia. Thousands of people all over the country have entrusted us to decorate such solemn events in their life as wedding, anniversary, corporate event, graduation and many other holidays. The high quality of the goods and the excellent service of KROKUS are evidenced by a lot of positive feedback on our official website and pages in social media platforms. Flowers online in Riga at the best prices are waiting for you in KROKUS. If you want to find the best online flowers in riga or another city in Latvia at the most appropriate price, then the best solution is to contact our online shop. Why is KROKUS the best place to order flowers online in riga (Latvia)? ● excellent choice of gifts and additions to flowers. Particular attention should be paid to the choice of the size of almost any arrangement. We do not impose on the customer the purchase of a standard bouquet. 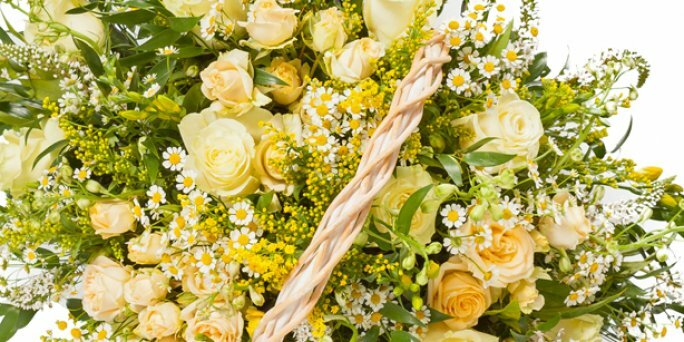 Instead, you can create yourself gift flowers online in Riga (Latvia), indicating the number of flowers in the arrangement, according to the planned budget. In addition, when choosing flowers, you can simply choose the sum that you are willing to spend, and our florists will pick up the optimal bouquet size for you. Another advantage of our online shop is the possibility of twenty-four-hour delivery of flowers in Riga, as well as the work of courier service on weekends and holidays. Such a service cannot be found in any company of the delivery of bouquets all over Latvia. To send flowers online to Riga easy, using the courier service of KROKUS. How to send online flowers to Riga or another city in Latvia? To order flowers and gifts online with delivery in Riga or in any part of Latvia, use the services of the online shop KROKUS. Go to the catalog of goods and select the appropriate bouquet, then specify its size, add a souvenir or a postcard and add the arrangement to the shopping cart. When ordering, indicate the desired time and place of delivery. Please note that our courier service also offers flower delivery at night and exactly on time. After indicating the contact information of the recipient, you can pay for the order in one of convenient ways. Further work on creating a fantastic flower arrangement and presenting it to the gifted will be taken over by the specialists of the company KROKUS. If you have difficulty making an online purchase, you can safely call our manager at the specified number to complete the application in telephone mode.